How many of you have been through the agony of the unexpected expense you last incurred? For the unprepared it means taking out the credit card and piling up even more debt. Not only that, but it also means paying far more for the expense than required, thanks to interest. Since the unprepared typically take months, or even longer, to pay off these expenses, that interest can take a toll. The only solution is to start preparing now. Need a good reason to start an emergency fund? Here are seven costly items that can break any time — and that might make you really consider stocking away some money every month. Our dependence on computers cannot be undermined and this isn’t necessarily a bad thing. We can do things on them that we just cannot do otherwise. The biggest drawback is that when the computer breaks, and computers do break often and for multiple reasons, we need a quick replacement. Since a new computer will cost you thousands, it’s best to start saving now for that inevitable day when your computer dies. Life without a Refrigerator in unthinkable these days. When you rent fully furnished apartment you don’t really think about these expenses. If your refrigerator goes, your landlord may provide a new one. But when you own a home that’s just not the case. And do you know how much a decent refrigerator costs? Maybe you don’t want to know. Maybe you’re better off just starting to save now, so you’re thankful for those savings when you finally do need to replace yours. There is perhaps no greater hassle in life than when something goes wrong with your car. It means you have to spend a lot of money as you cannot do without a car. Having an emergency fund for these instances can mean covering the cost of repairs and maybe having enough for a two- or three-day rental. And hey, you never know when you might end up needing a new car. Even if you have insurance, you never know what it might not cover. This goes especially for dental insurance, which can get quite technical. Need to stay in the hospital? That could cost you, too. Insurance is nice, but it doesn’t cover everything. Best to have a little money parked away just in case…. Here’s something else apartment dwellers never have to face: a broken air conditioner or water heater. Like the refrigerator, this is something you need fixed immediately, so there’s really no time to scramble for cash. Again, you don’t want to see the price of a new air conditioner with installation, of course. There is no doggie health insurance. Sorry, but you have to cover Jimmy’s costs out of pocket. Pets might not be as expensive as children, but they’re not cheap either. Unexpected events occur all the time, and because they’re unexpected we’re typically unprepared for them. While there is no way to prepare emotionally for an unexpected eventuality in the family, there is a way to prepare financially. 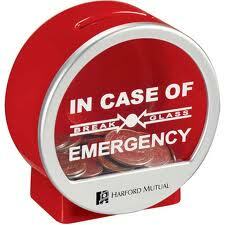 An emergency fund can help you cover travel costs and your portion of the contingency costs. You just never know when you have to book a last-minute flight. This is Michelle.I recently had the opportunity to look through your site [moneymazics.com]. You have quality & useful posts.I write for many financial communities.I would be highly privileged if you allow me to write for your website. The article will be completely free of charge and all I want is just a back link for my site. Note: I can give you relevant back-link and can promote your site. And we can decide on exchanging backlinks..